This data set provides a collection of maps of geoecological characteristics of areas within the Beechey Point quadrangle near Prudhoe Bay on the North slope of Alaska: a geobotanical atlas of the Prudhoe Bay region, a land cover map of the Beechey Point quadrangle, and cumulative impact maps in the Prudhoe Bay Oilfield for ten dates from 1968 to 2010. The geobotanical atlas is based on aerial photographs and covers 145 square kilometers of the Prudhoe Bay Oilfield. The land cover map of the Beechey Point quadrangle was derived from the Landsat multispectral scanner, aerial photography, and other field and cartographic methods. The cumulative impact maps of the Prudhoe Bay Oilfield show historical infrastructure and natural changes digitized from aerial photos taken in each successive analysis year (1968, 1970, 1972, 1973, 1977, 1979, 1983, 1990, 2001, and 2010). Nine geoecological attributes are included: dominant vegetation, secondary vegetation, tertiary vegetation, percentage open water, landform, dominant surface form, secondary surface form, dominant soil, and secondary soil. These data document environmental changes in an Arctic region that is affected by both climate change and rapid industrial development. There are four compressed shapefiles (*.zip) and one geotiff (*.tif) in this data set. The geobotanical atlas of the Prudhoe Bay Region (Walker et al. 1980) is provided as a companion file in .pdf format. The shapefile data are also provided as companion files in .kmz format for viewing in Google Earth. 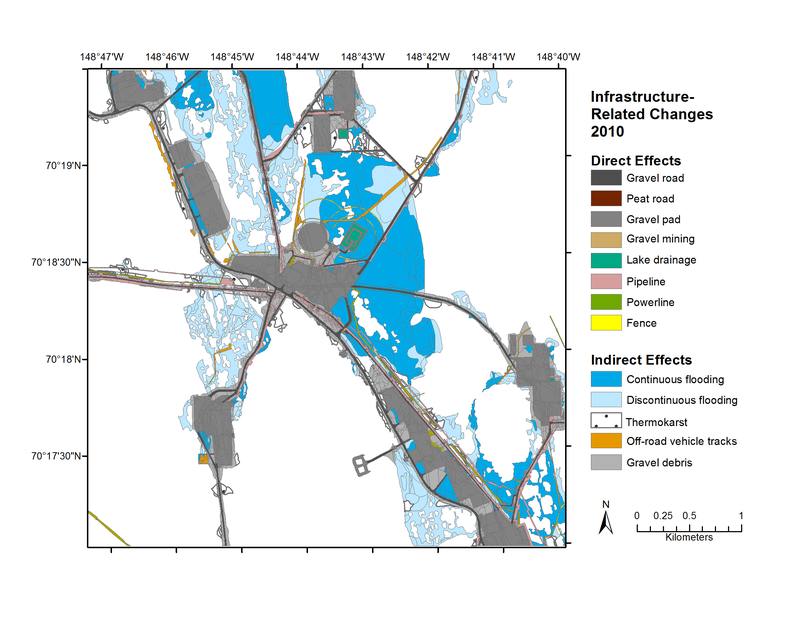 Figure 1: Cumulative impact map of infrastructure related disturbances from 2010 for Prudhoe Bay Oilfield site A. The Arctic-Boreal Vulnerability Experiment (ABoVE) is a NASA Terrestrial Ecology Program field campaign taking place in Alaska and western Canada between 2016 and 2021. Climate change in the Arctic and Boreal region is unfolding faster than anywhere else on Earth. ABoVE seeks a better understanding of the vulnerability and resilience of ecosystems and society to this changing environment. These data were obtained from the Alaska Arctic Geoecological Atlas (http://agc.portal.gina.alaska.edu), which provides access to existing Arctic vegetation plot and map data in support of the ABoVE campaign. There are four compressed shapefiles (*.zip), one geotiff (.tif), and a PDF in this data set. The shapefile data are also provided as companion files in .kmz format for viewing in Google Earth. NOTE: Cumulative impact disturbance and surface feature codes are described in Tables 3-9 below. Each shapefile is zipped with 6-7 thematic layers that provide symbologies for the shapefile data content. Primary surface 4 Sandy yellow Residual surfaces unaffected by thaw-lake or river processes; may include some very old indistinct thaw-lake basins. Pingo 11 Red Small hills usually in drained thaw-lake basins. All the pingos in the mapped areas are closed system pingos, which are formed by hydrostatic forces that occur as the unfrozen sediments beneath the previous lake are refrozen after lake drainage. Within the map area, pingo dimensions are usually several tens of meters in diameter and up to 15 m high. Stabilized floodplain 13, 15, 20 Dark sandy rose Areas adjacent to the very active floodplain that are vegetated but regularly flooded by spring and/or summer flood events. Also includes ancient floodplains with well-defined terraces, oxbow lakes and cut off stream channels, and drainages of smaller streams (code 15). The map unit also includes small areas of bluffs (code 20) along the Putuligayuk River on Map B.
High-center polygons, center-trough relief > 0.5 m 1 Orange High-centered ice-wedge polygons have an elevated central portion to the polygon and troughs that are relatively low and a few meters wide. Formed by thawing of the ice wedges and subsidence of the trough surface. High-centered polygons with > 0.5 m of relief occur in areas with relatively steep hydrological gradients such as along lake margins and stream terraces and some pingos. The unit usually forms a narrow band a few meters wide along the margin of streams and shoreline of former thaw lakes. High-center polygons, center-trough relief < 0.5 m 2, 11 Yellow orange High-centered polygons with < 0.5 m relief occur in flatter, usually well-drained terrain, where there has been some subsidence of the ice-wedge polygon troughs. The centers may be nearly flat, and in some situations, particularly well-drained situations near streams and drained thaw-lake margins, a secondary pattern of small nonsorted polygons is common (code 11). Mixed high- and low-centered polygons 5 Dark brown Complex patterns consisting of both high- and low-centered polygons. Usually this unit occupies relatively small areas and represents incomplete topographic adjustment to a recently decreased base level, for example the drainage of a thaw lake or the relatively recent headward extension of a tributary drainage. center-rim relief > 0.5 m 3 Blue green Low-centered ice-wedge polygons have a low central basin, an elevated rim around the basin, and low troughs that overlie the ice wedges and separate a polygon from adjacent polygons. Low-centered polygons with greater than 0.5 m of relief between polygon centers and rims are common in sandier portions of the oilfield and in the river deltas. Most of the polygon centers have standing water with aquatic vegetation. center-rim relief < 0.5 m 4 Light blue green Low-centered polygons with less than 0.5 m of relief between polygon centers and rims with polygon diameters of approximately 10-15 m.
Irregular pattern 7 Light blue Irregular or weakly developed patterned-ground features occur mostly in wet drained lake basins. The raised features may consist of weakly developed strangmoor, aligned hummocks, and/or disjunct polygon rims that are visible on aerial photographs at 1:6,000-scale. Featureless 10 Medium yellow Featureless or with patterned-ground occupying less than 20% of surface. partially vegetated in the central portion of the circle and surrounded by vegetation in the margins. Most nonsorted circles in the Prudhoe Bay region are 1-2 m in diameter, flat to slightly domed in the center, with center-center spacing of 2.5 to 4 meters. Other terms include frost scars, frost boils, mud boils, mud circles, and spotted tundra. Thermokarst pits 14 Blue dots over other pattern Small ponds, generally circular in form, a few meters in diameter and often over 70 cm deep. Thermokarst pits form at the junction of ice-wedges, where there has been thawing and subsidence of the ice wedge. With further thawing of the ice-wedge, the ponds can deepen and enlarge and extend along the length of the ice wedge. These features were mapped on the 1973 1:6000 black and white aerial photographs wherever the density of pits was greater than 4 pits per 1-cm circle. Most of the pits were also visible on the 1949 1:24,000-scale BAR photographs. The features were most often mapped as secondary surface forms in conjunction with other patterned-ground features. Floodplain surface forms 13, 8, 16 Dark gray Active floodplain features including channels, river bar and river bank deposits and erosion features. The map unit also includes small areas of hummock terrain (code 8), and actively eroding banks (code 16) along the Putuligayuk River on Map B.
Soils of dry tundra 1 Red Cold, well-drained, base-rich mineral soil with a dark, humus-rich surface horizon (mollic epipedon); calcium carbonate deposits occur on the underside of gravel fragments and free carbonate precipitates throughout the mollic epipedon; little evidence of cryoturbation; a deep active layer exceeding 1 m; mainly on pingos, but also some well-drained sites on terraces along streams and rivers. Soils of moist tundra 2 Orange Cold, moderately-drained soil complex, with a dark, base-rich, humus-rich mineral surface horizon (mollic epipedon) or a thick well-decomposed organic surface horizon (histic epipedon); the mineral horizon usually shows some mottling; underlain by permafrost within 1 m of the surface; usually associated with moderately well-drained areas between thaw lakes, river terraces, and stabilized dune features. Considerable cryoturbation may be present due to the presence of either non-sorted circles and/or small non-sorted polygons. Soils of wet tundra 3, 8 Brown Cold, wet soil complex. Most soils have thick organic surface horizons of varying degrees of decomposition that overlie wet, silty to loamy, base-rich, gleyed mineral horizons; the depth of summer thaw is generally < 50 cm; occurs in drained lake basins with either featureless or irregular patterned ground. Wet patterned-ground soil association 4 Tan Cold, wet association of soils occurring in areas of wet patterned-ground, mainly low-centered polygon complexes. Non-sorted circle soil association 5 Light gray Cold, wet association of soils occurring in areas of non-sorted circles. Soils along stream and river channels 10, 6 Dark gray Well-drained, gravelly or sandy alluvial soil with little horizon development. The unit includes the gravel channels with no soils in the active floodplains of the rivers and streams and more stable river bars that may have some soil development. Sand dune soils or other soil covered by layer of aeolian sand 7, 9 Yellow Well-drained sand-dune soil, underlain by permafrost at considerable depth. Includes soils covered by a thin layer of wind-blown sand. 14 Barren tundra caused by oil spills, burns, blading, etc. These data document environmental changes in an Arctic region that is affected by both climate change and rapid industrial development. These data could be useful as a historical baseline for climate change studies in the local region or as model validation data. The cumulative impact maps may be used to examine changes in flora and fauna of the Prudhoe Bay region attributable to various types of human and natural disturbance. No quality assessment or uncertainty estimates were included with this data set. Much of the data is derived from visual observation of historical aerial photography. The Prudhoe Bay Oilfield (PBO) in northern Alaska was the first developed oilfield in the Arctic. It is an extremely important asset to the U.S. and the state of Alaska, containing 16% of U.S. proven reserves of oil and gas. In 2012, taxes on the oil from the Northern Alaska oilfields accounted for over 90% of the Alaska state budget. The PBO is located on the coast of the Beaufort Sea, halfway between the Canadian border and Point Barrow, a region that was remote and roadless prior to the discovery of oil in March 1968, and is still linked to the rest of the U.S. by a single 417-km road, the Dalton Highway. An extensive infrastructure network quickly followed the oil discovery, resulting in development within an approximately 2,600 km2 area along a 150-km portion of coastal tundra, located mostly between the Sagavanirktok River on the east and the Colville River on the west. Primary, secondary, and tertiary human disturbances for each observation interval (HUMANDIS*) were recorded based on interpretation of aerial photographs. Natural disturbances for each observation interval (NATDIS_*) were recorded based on interpretation of aerial photographs. Primary (SOIL1_49) and secondary (SOIL2_49) soils are based on interpretation of 1949 black-and-white aerial photographs. Landform (LANDFORM_49) is based on interpretation of 1949 black-and-white aerial photographs. Percent water cover (H2O_49) is based on interpretation of 1949 black-and-white aerial photographs. The geobotanical atlas of the Prudhoe Bay Region (Walker et al., 1980) covers most of the Prudhoe Bay Oilfield on the North Slope of Alaska that was under development in 1980, covering 145 km2. The map synthesizes work done for the US Army Corps of Engineers CRREL, the International Biome Program, and the UNESCO MAB Project 6. The mapping was based on aerial photographs taken in 1973 at a scale of 1:6000. The maps are thus a static representation of a type of arctic tundra at a time when only relatively minor terrain disturbance had occurred. It can be used as a baseline against which further natural and human-induced changes to the landscape can be measured. A geoecological approach was used in the mapping of landforms (12 units as well as linear mapping of steep embankments, undercut river banks, excavated areas and streams), soils (7 units) and land cover (29 natural vegetation units and 8 disturbed units). The land cover map (beecheypoint_landcover.tif) is a Landsat-derived land cover classification of the Beechey Point quadrangle (1:250,000 scale) with descriptions of the major vegetation units. Eight Landsat-level units derived from the multispectral scanner data, eleven photo-interpreted units, and eight common vegetation complexes were described and illustrated. The region was divided into four landscape units: flat thaw-lake plains, gently rolling thaw-lake plains, hills, and flood plains. Area analysis of the quadrangle was done according to townships and nine small study areas. The mapping used a hierarchical tundra mapping classification approach. Area measurement data from geobotanical maps at eight study sites were compared with similar data from Landsat maps of the same sites. The results indicated that Landsat maps yielded area measurements corresponding to broad geobotanical categories. Please see Walker & Acevedo (1987) for additional information on the methods used to produce this land cover map. Raynolds M.K., Walker D.A., Ambrosius K.J., Brown J., Everett K.R., Kanevskiy M., Kofinas G.P., Romanovsky V.E., Shur Y. & Webber P.J. 2014. Cumulative geoecological effects of 62 years of infrastructure and climate change in ice-rich permafrost landscapes, Prudhoe Bay Oilfield, Alaska. Global Change Biology 20: 1211-1224. Walker, D. A. and W. Acevedo. 1987. Vegetation and a Landsat-derived land cover map of the Beechey Point Quadrangle, Arctic Coastal Plain, Alaska. CRREL Report 87-5.